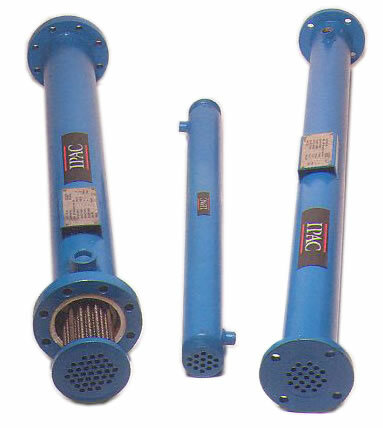 IPAC offers a compact shell and tube compressed air aftercooler because of its unique extended tube surface area. Appropriate for packaged compressors or sites where space is limited. Manufactured with either a patented Helical or plain tube configuration, IPAC 51 series aftercoolers are designed to deliver a 15-20 degree approach temperature, depending on water quantity and temperature. The IPAC 59 series Aftercooler delivers a 5-10 Fahrenheit approach. As hot compressed airflows through the extended surface tubes of Water Cooled Aftercooler, the cooling water flows on the outside of the tubes in the opposite direction. This counter-current arrangement makes the tube walls progressively colder for maximum cooling efficiency. Heat from the compressed air is transferred throughout the tube walls to the water, thereby reducing the air temperature steadily until the dew point is reached. Cooling causes the vapor to condense on the tube walls forming water droplets, thus reducing the water vapor content of the compressed air.